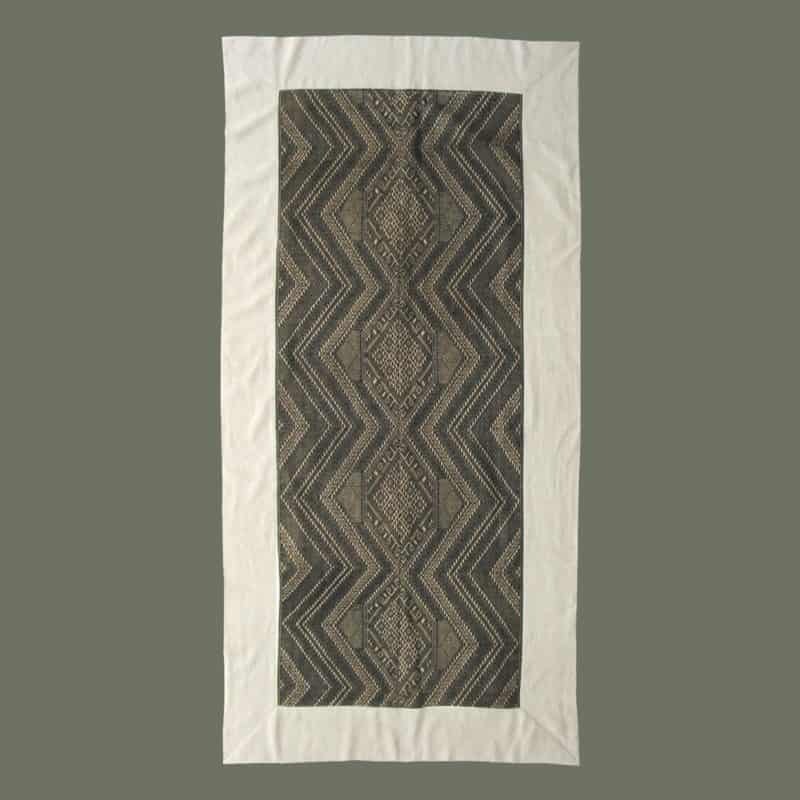 Alternating supplementary weft silk designs with weft silk ikat, this tubeskirt is of classic design and materials. 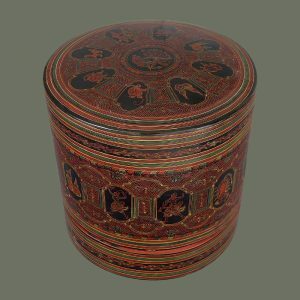 We don’t think it is one of the spirit house designs used by shaman, but it is similar in style. 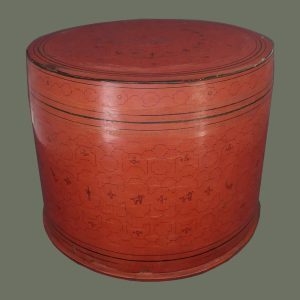 The red silk warp and red silk panels are colored with natural lac. Indigo cotton combines with the red silk to make dark purple bands. Other colors are likely from synthetic dyes. Hemband appears to be original; all sewing is by hand. Condition is very good, with one, inch long repair (see detail) and some soil on the waistband. Size: 52 in. x 35.5 in. 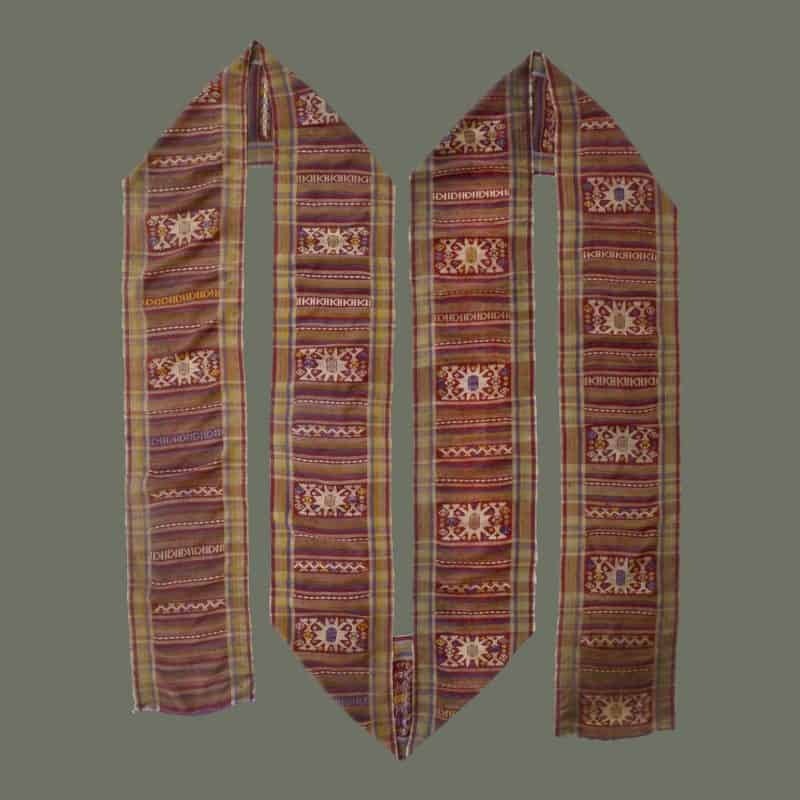 Specially-designed textiles like this one are used for funerals, often draping the coffin or a wall. The motif used is stylized nagas surrounding diamonds, with multi-tiered, royal umbrellas interspersed. 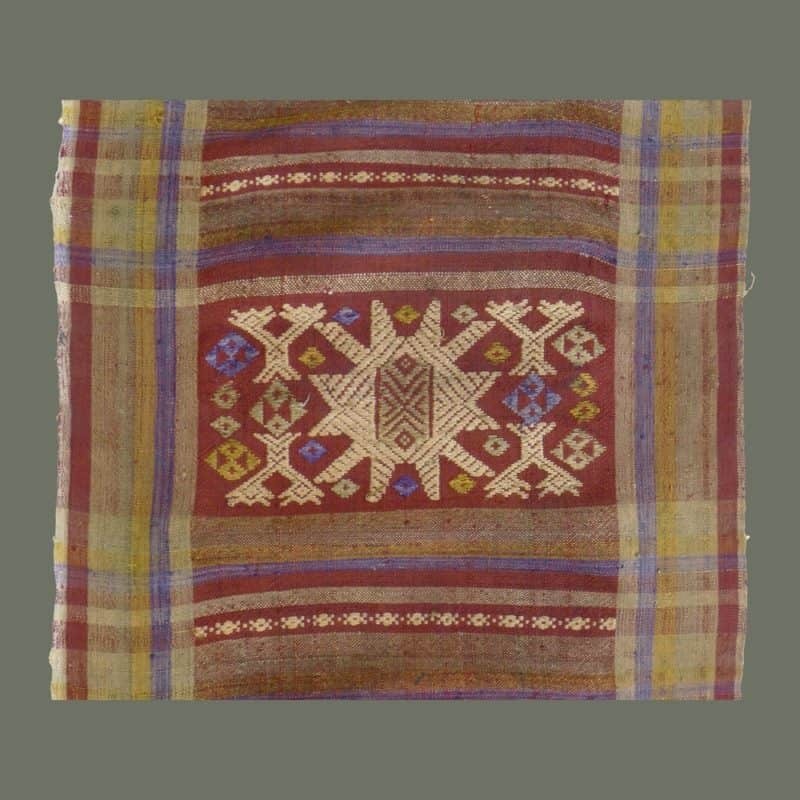 Of richly colored silk with weft ikat patterning, this is an unusual find. Condition is excellent. 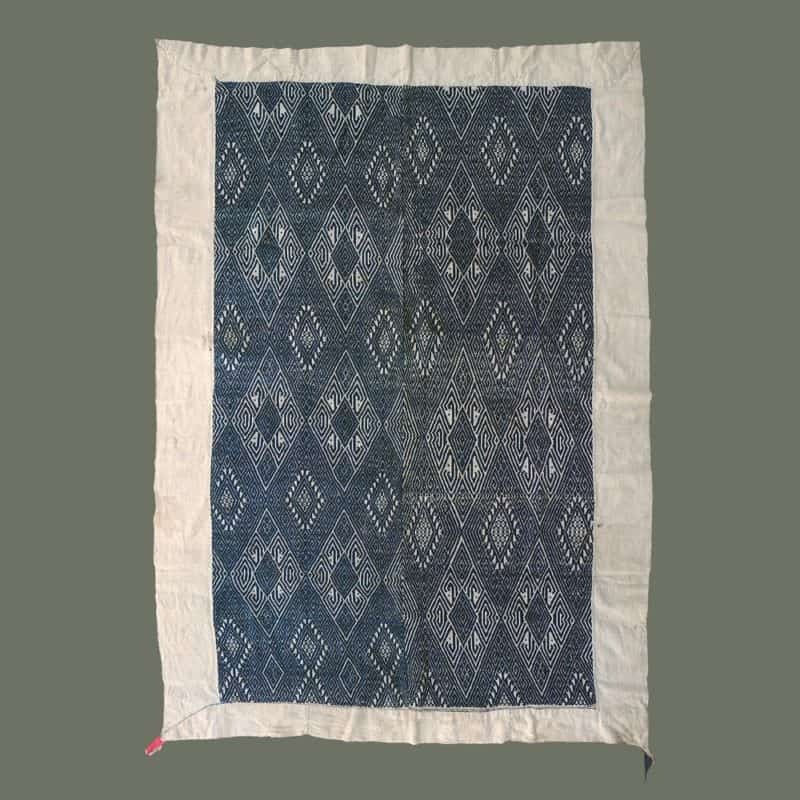 The strongly graphic star pattern is nicely executed on this old blanket from Xam Neua in all handspun cotton- dark indigo on natural. Richly geometric it uses lines and checkerboard patterning to great effect. One small original repair is the only real condition issue; otherwise condition is excellent, with a recent addition of handspun hemp border and backing. 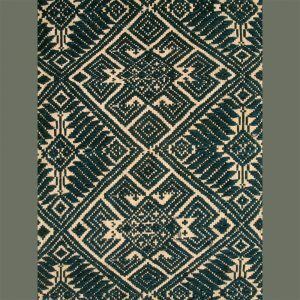 This wild and crazy blanket comprises two narrow panels of handspun cotton with supplementary weft designs in cotton and silk. 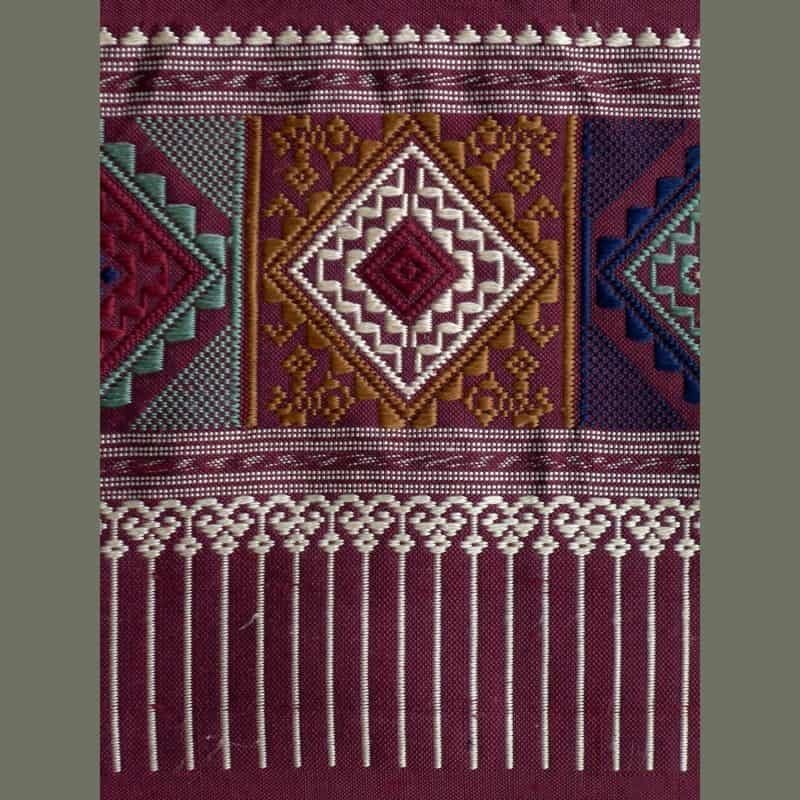 The zany designs appear to be a sampler of weaving motifs, with each one done with a pattern repeat, but few repetitions of designs. Lighthearted and fun, this would be especially attractive used to decorate a child’s room. 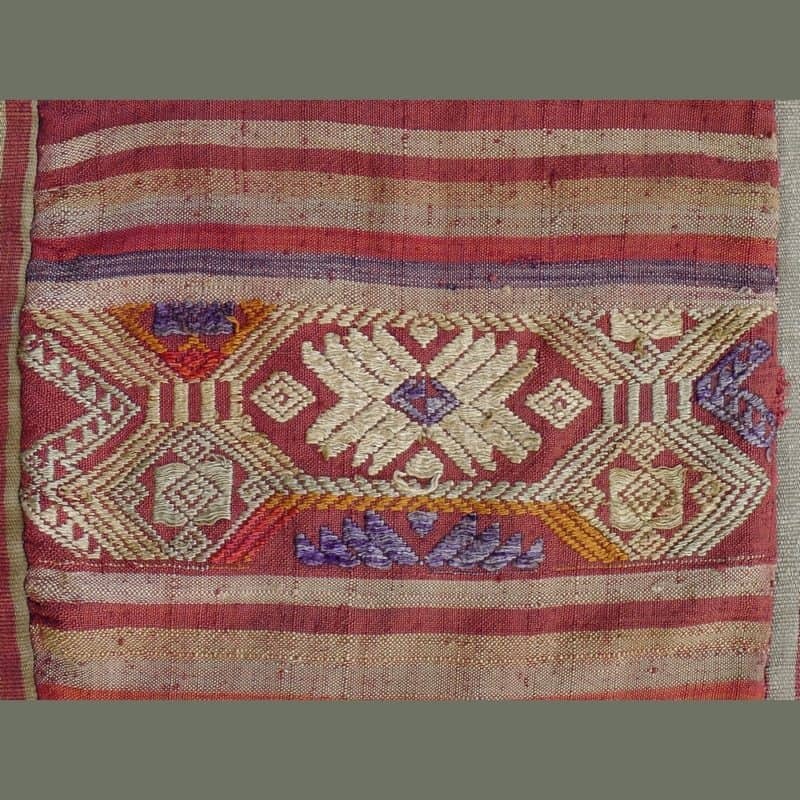 Condition is excellent; a handwoven hemp border and backing is a recent addition. 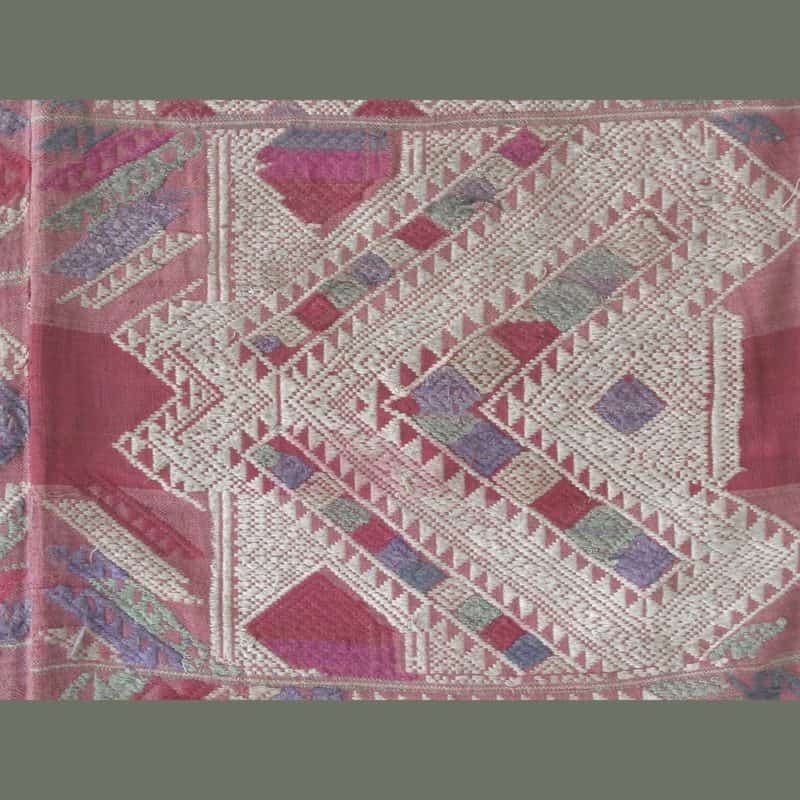 Not often seen, this handsome silk blanket and its mate (TAL 305) are in the Xiang Kham style, from Xiang Khoang Province. 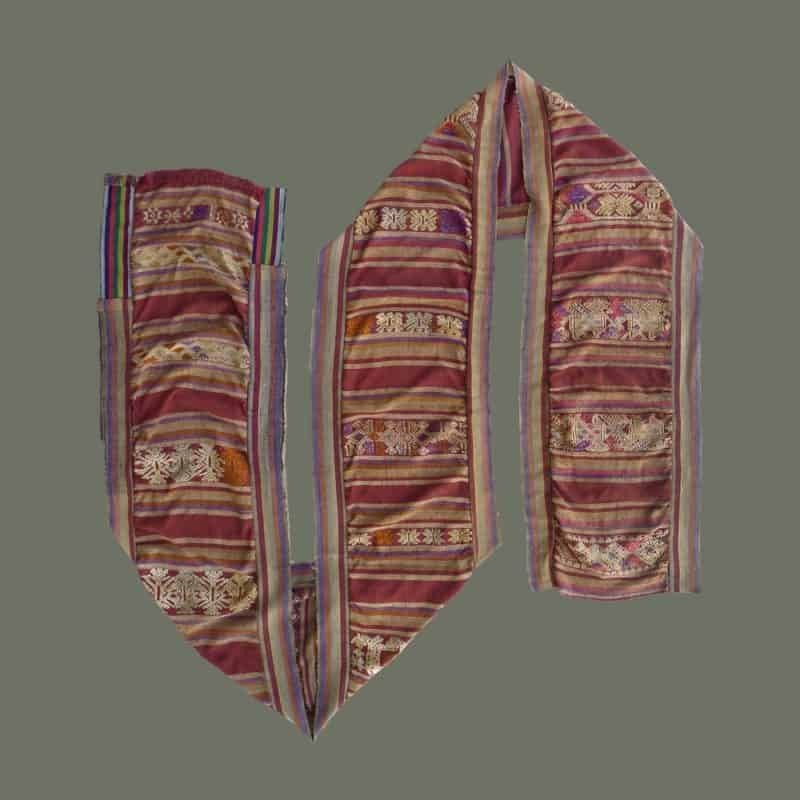 Called ‘phaa hom’, these would have been used for sleeping by high status individuals. We were told that this one was for the father and TAL 305 was for the mother. 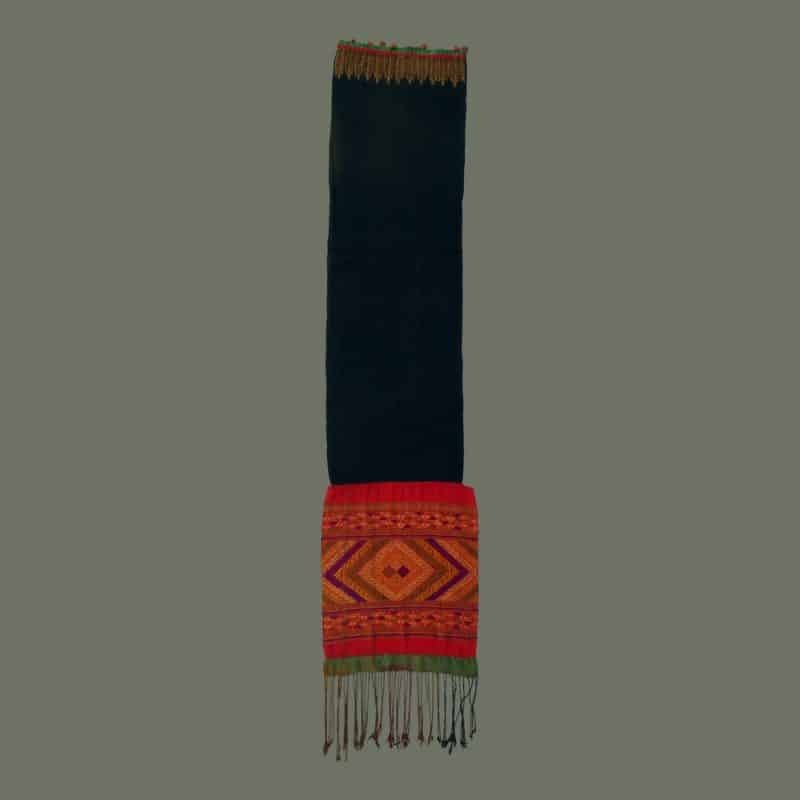 Comprising one complete panel it has pattern bands of golden brown silk woven in continuous supplementary weft between bands of black, with a decorative border at one end in discontinuous supplementary weft. 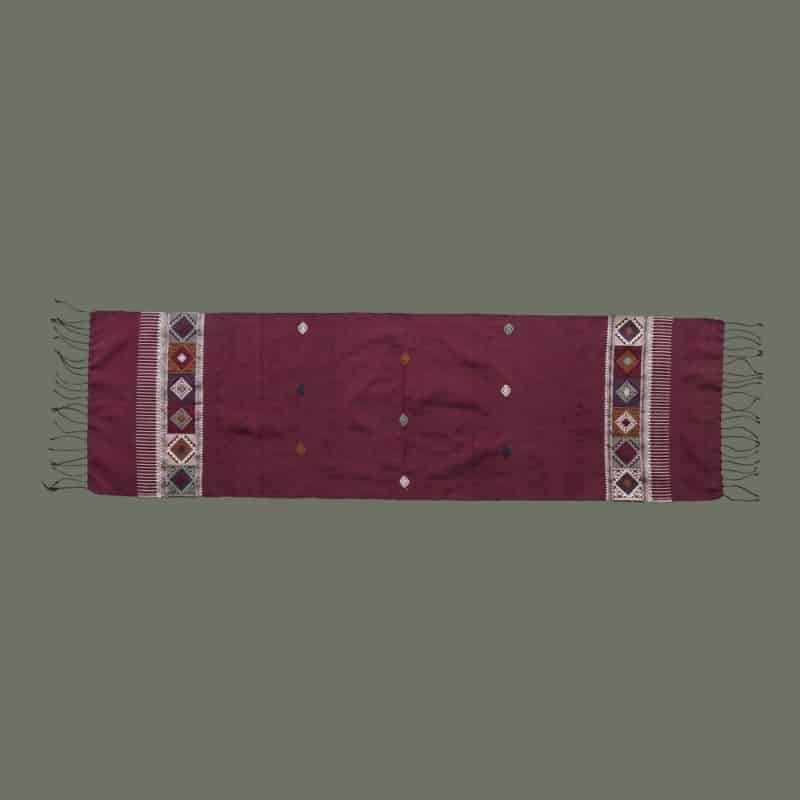 It is backed and bordered with handspun cotton in a rich brown color. Condition is excellent. 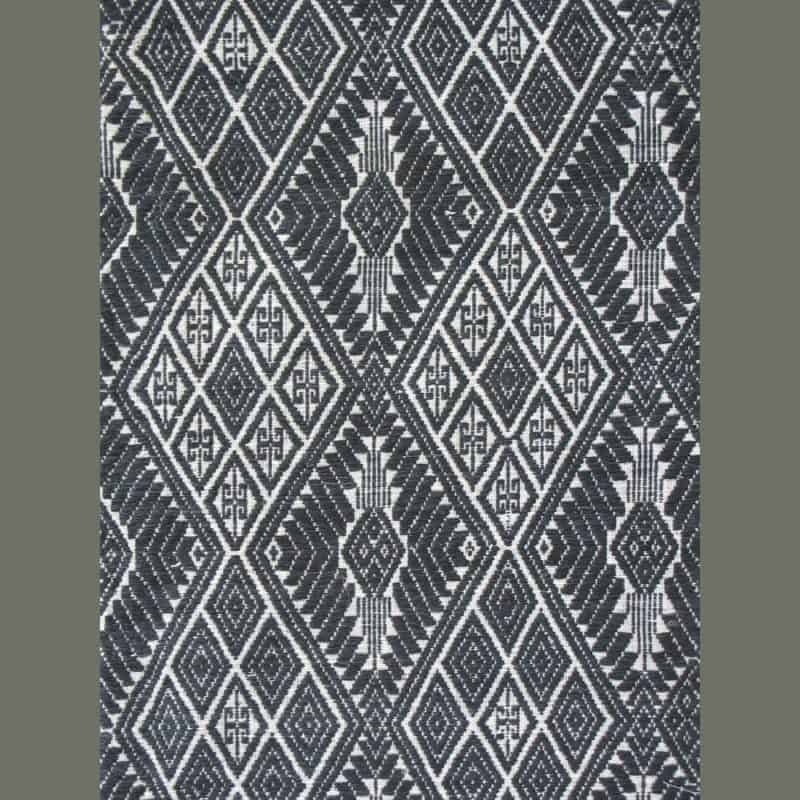 Please see Patricia Cheesman’s Lao-Tai Textiles, p.215, fig. 9-23 for a similar example. We can offer the pair together for a special price- please inquire. Field: 63.75 in. x 31 in. ; OA: 67.75 in. x 36.75 in. 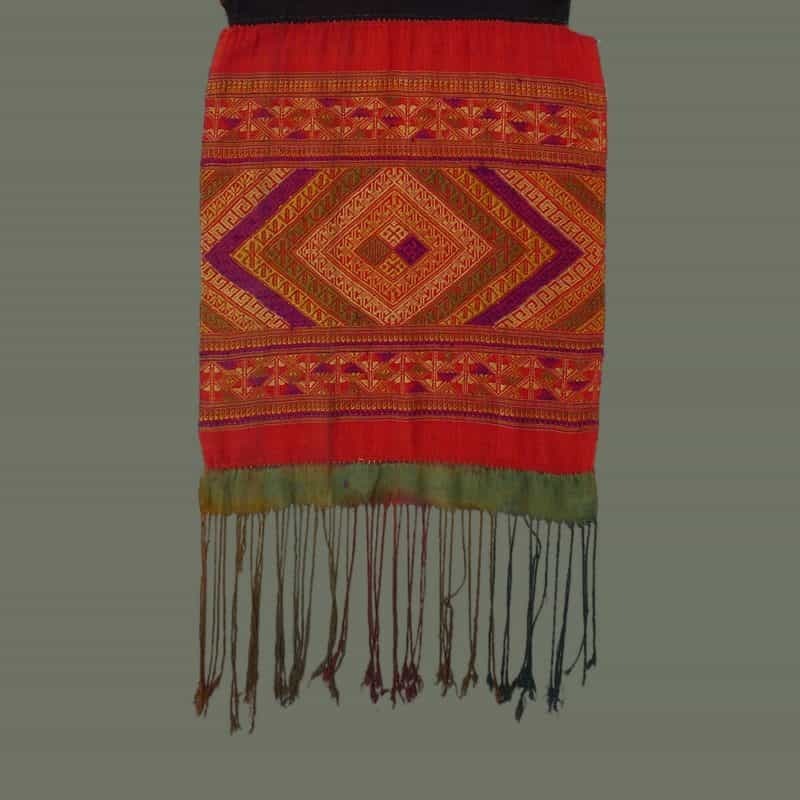 This is a classic Lao Tai tubeskirt with silk supplementary warp pattern bands on a foundation of indigo cotton and red silk wefts. The hemband is especially well-suited for this skirt and complements it nicely. As expected, there is some wear, but it does not detract; otherwise condition is very good. 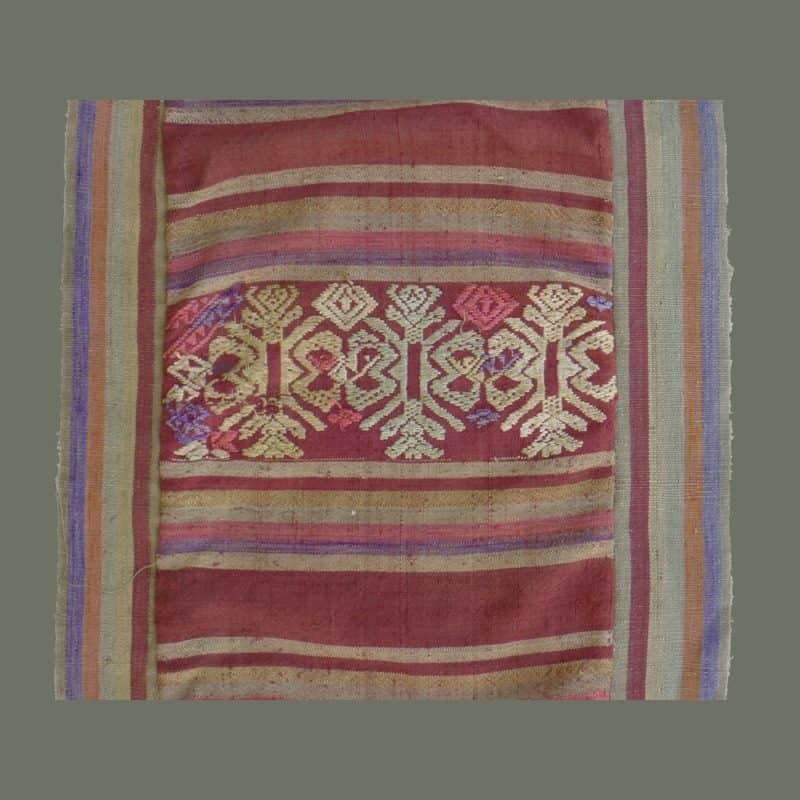 Possibly from Tai people in Vietnam, near the border with Laos, this old headcloth is nicely detailed with one end of discontinuous supplementary weft silk on silk, and the other very finely embroidered in an attractive pattern, and edged with silk pompoms. The mid-section is fine, possibly handspun, cotton dyed black, tho it is more of a dark brown, suggesting a natural ebony dye. Interestingly, the fringe has been dipped into different colors to achieve a multicolor effect, rather than have differently colored fringe attached separately. Condition is very good. 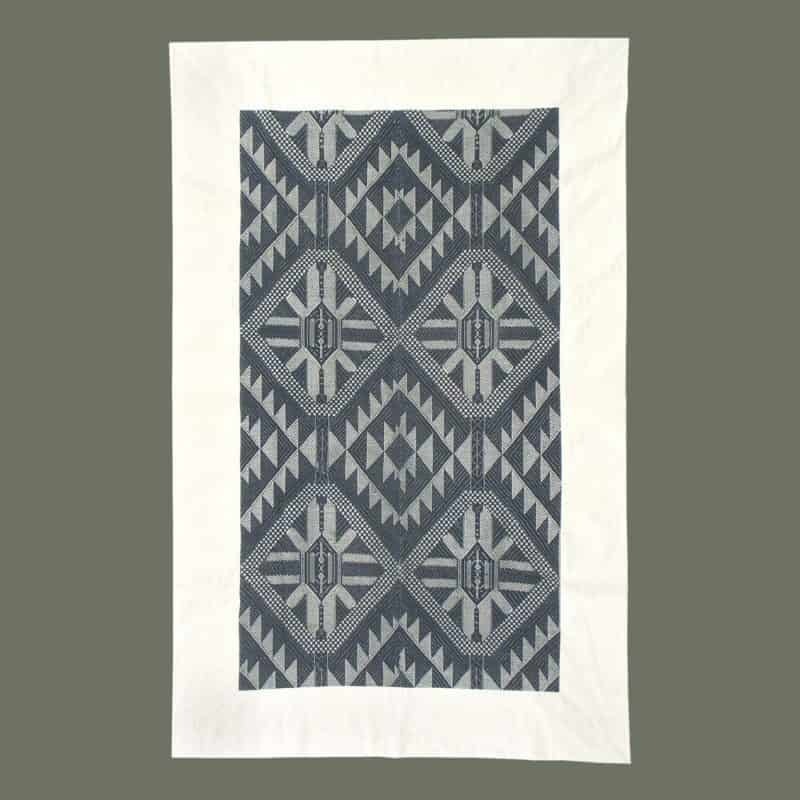 This piece could be displayed as shown, or made into one-of-a-kind decorative pillows. 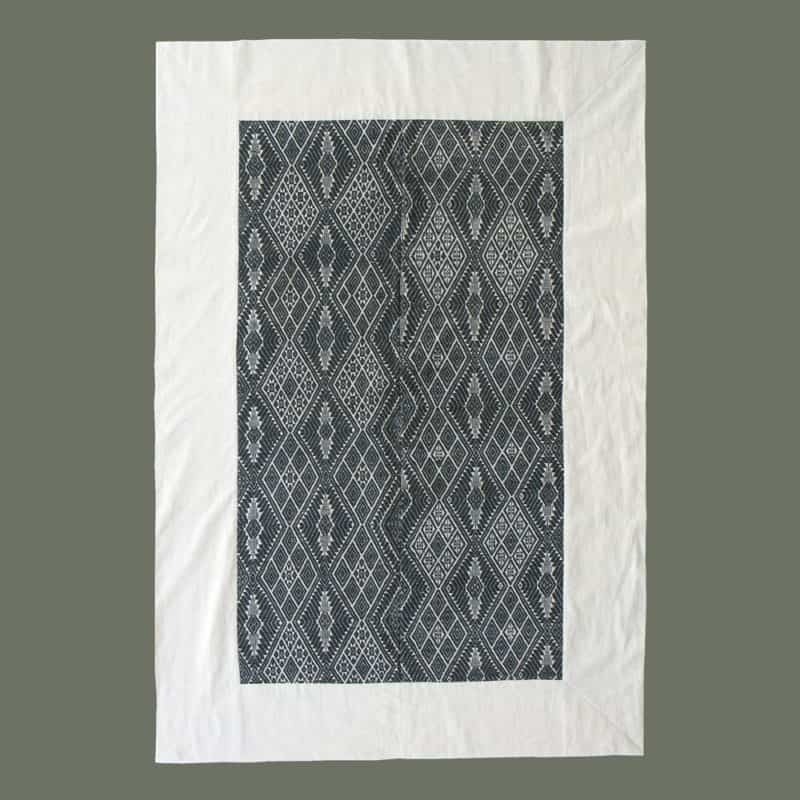 In good condition for its age, this is half a border and can go with TAL460b, or can be purchased separately. It is all silk and with mostly natural colors and a border of silk and cotton in complimentary colors. 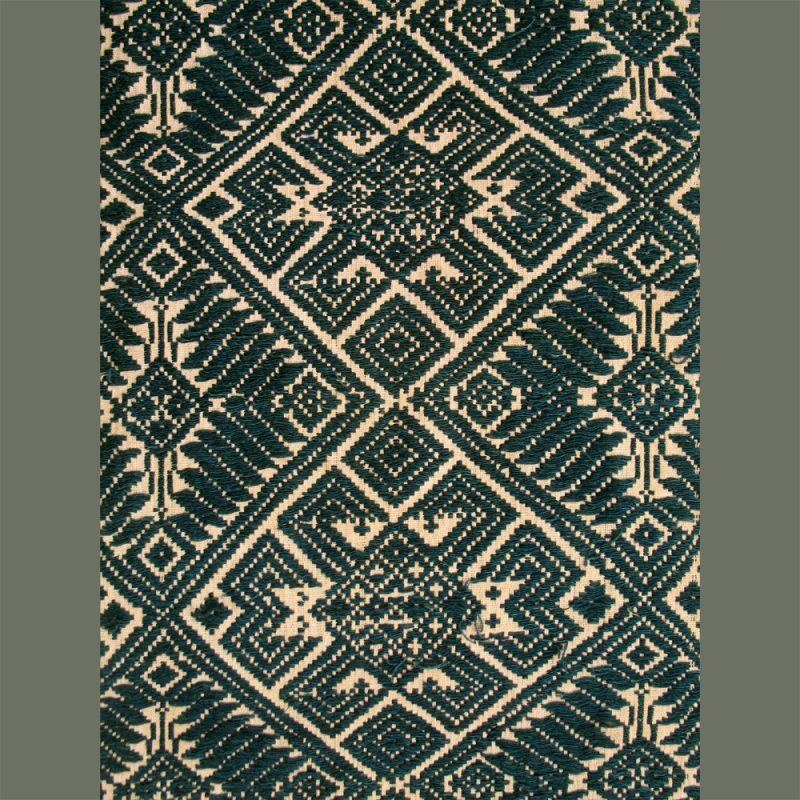 Stripes fill in between the attractive supplementary weft motifs of animals and stylized flowers. 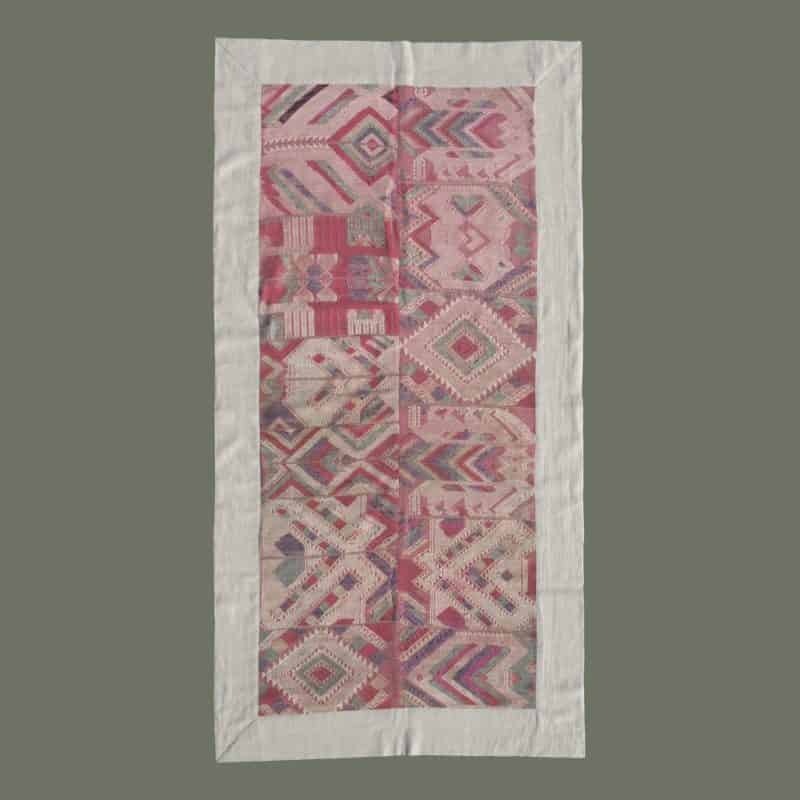 These pieces could be used as window valances or cut up for pillows or other decorative uses. We rarely find old mosquito net borders in good condition anymore. 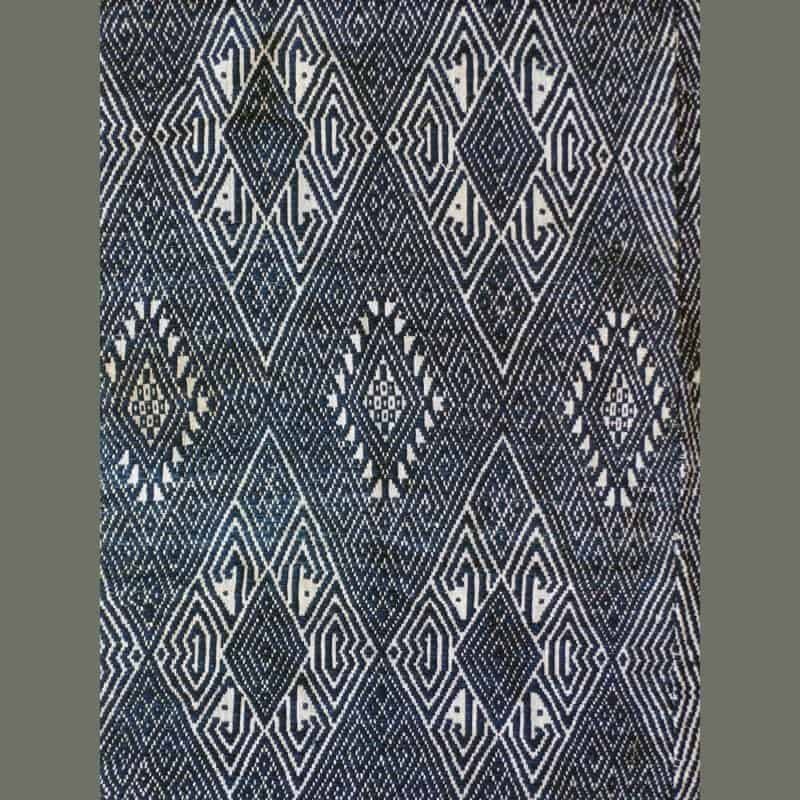 In good condition for its age, this is half a border and can go with TAL460a, or can be purchased separately. It is all silk and with mostly natural colors and a border of silk and cotton in complimentary colors. 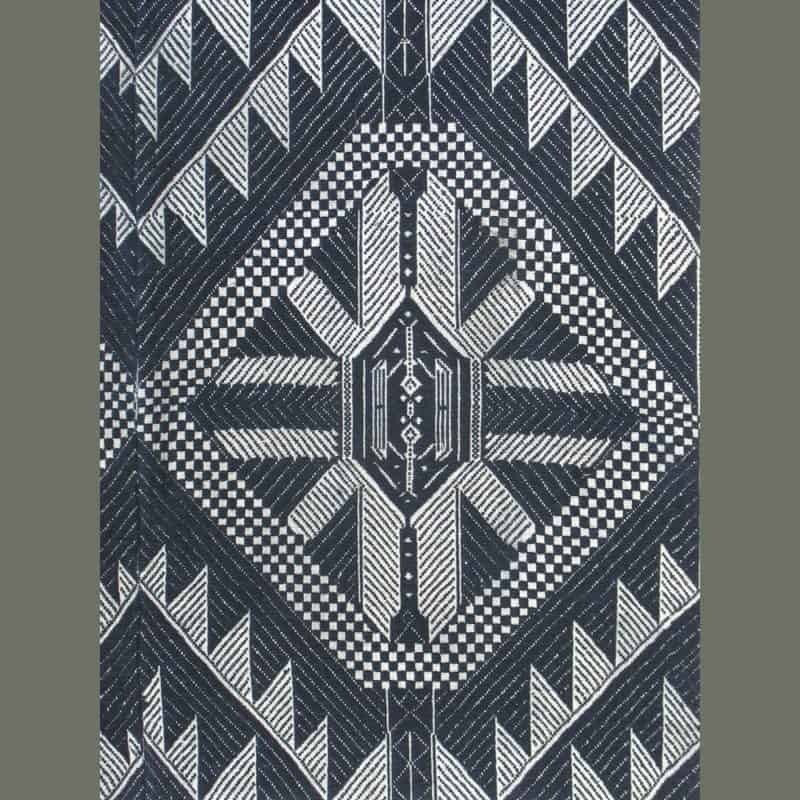 Stripes fill in between the attractive supplementary weft motifs of animals and stylized flowers. 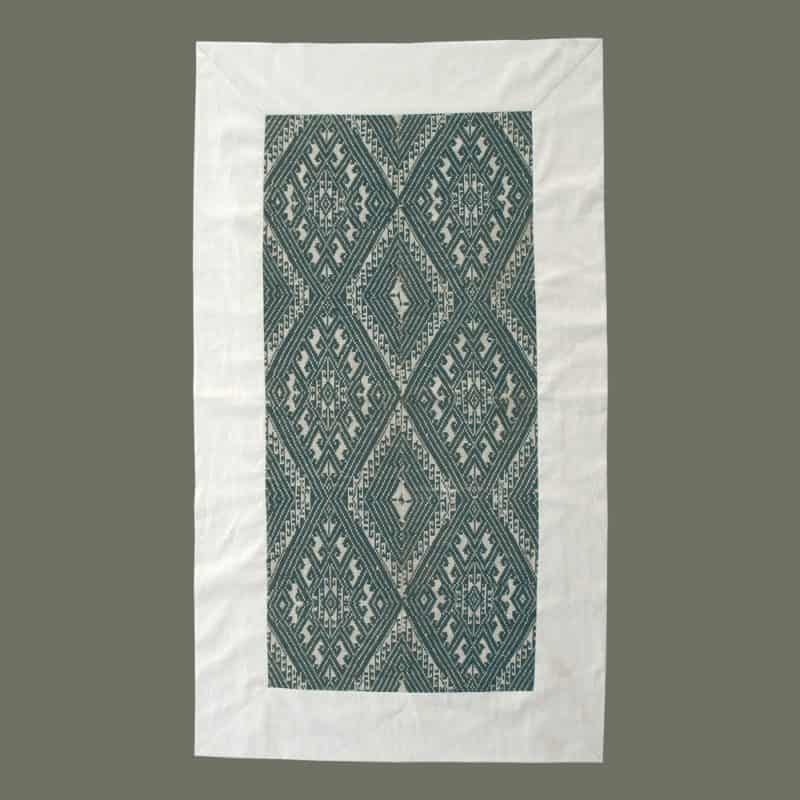 These pieces could be used as window valances or cut up for pillows or other decorative uses. We rarely find old mosquito net borders in good condtion anymore. This lovely old mosquito net border is in good condition for its age. 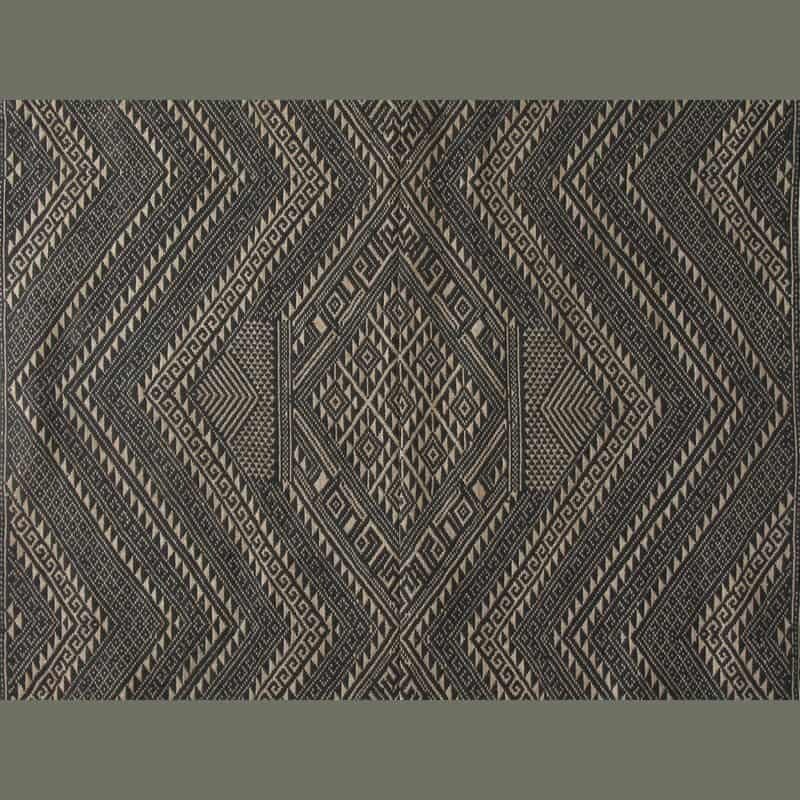 With a border woven integrally with the central panel, it is very carefully made with silk warps and wefts in rich earthy colors. 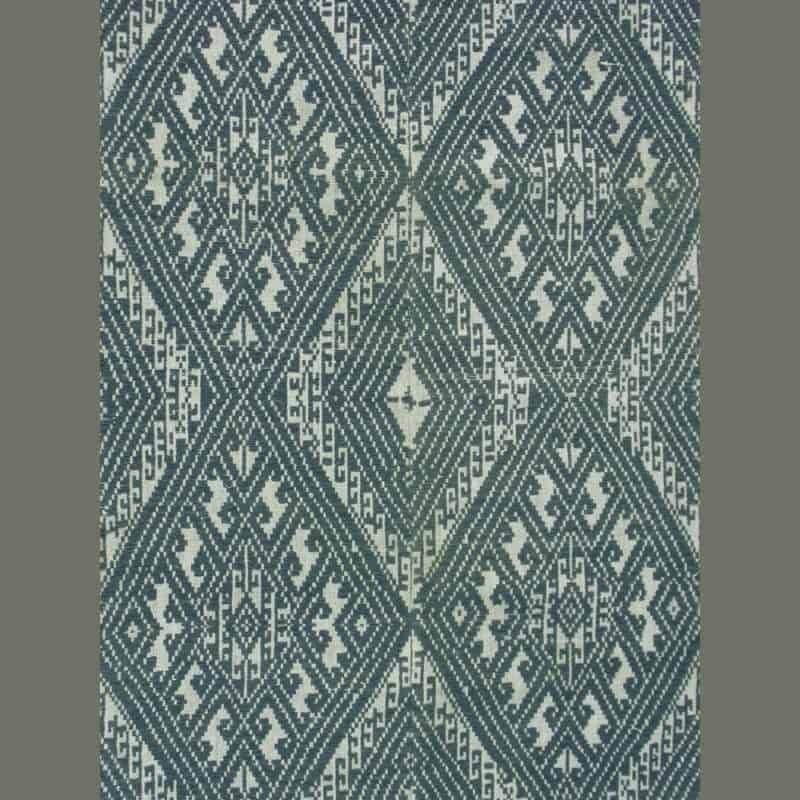 We think it may be from Tai people in Vietnam, as it includes motifs of letters that we often see on textiles from Vietnam. Other motifs include stylized, star-like flowers and an abbreviated lattice pattern. There is some discoloration from soil and a few small holes, but this is overall a very nice example. 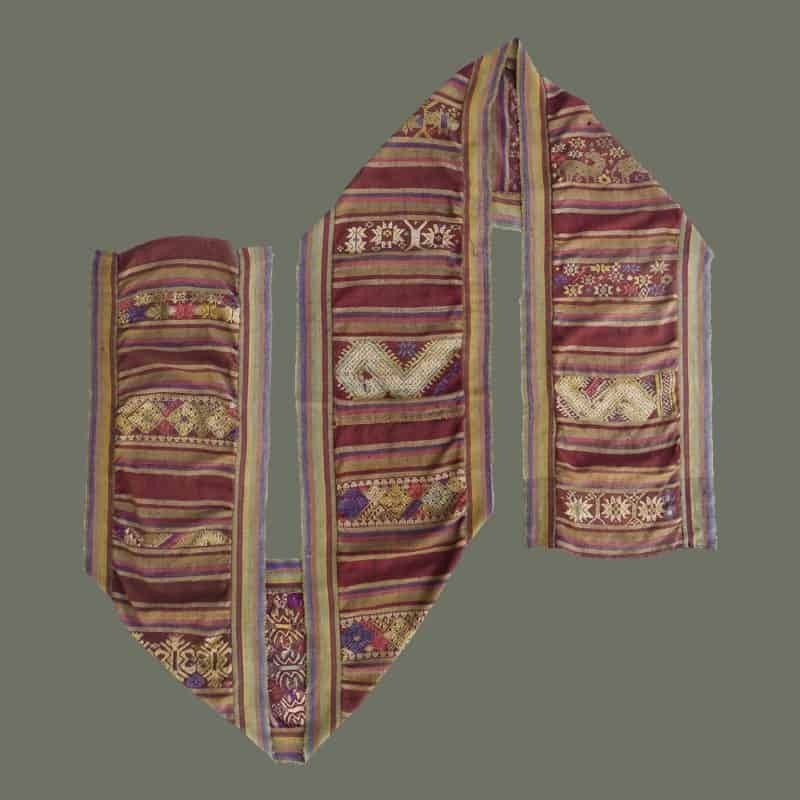 It could be used intact as a room valance, or cut up for other decorative purposes.